Cuckoo for Blackberries!!! I love EVERYTHING made from blackberries – yum!! The little things you take for granted, like picking wild blackberries. My grandmother and I would go down the street to a field near her home with a couple of buckets and pick as many as we could carry. She would work her magic and turn them into everything she could, pies, jam, cobbler and yummy pancake syrup. Gone are the good ol’ days. The field is now a church and my Grandmother long gone. But boy I would g give anything to go back in time to relive those wonderful days of childhood! This is the recipe that conjured up my wonderful memories. 1. In a medium saucepan, combine 2 cups blackberries and sugar over medium heat. Slightly muddle blackberries, and stir until mixture comes to a boil. Reduce heat to medium-low, and simmer, stirring frequently, until sugar dissolves, about 5 minutes. 2. Combine cornstarch and 3 tablespoons water in a medium bowl. Whisk cooked blackberry mixture into cornstarch mixture. Return blackberry mixture to pan, and add zest, cinnamon, and nutmeg. Cook, stirring constantly until mixture boils 1 minute and thickens. Remove from heat; add butter, and stir until melted. 3. In a large bowl, add remaining 4 cups blackberries. Gently stir in cooked blackberry mixture. Set aside, and let cool to room temperature. 4. Preheat oven to 400°. Cut 12 (5-inch) circles from parchment paper, and set aside. 5. Divide Cajun Sweet Dough into 12 equal pieces. With floured hands, roll each piece into a ball. On a heavily floured surface, using a floured rolling pin, roll each dough ball to a 5-inch, ⅛-inch-thick circle. 6. Place each circle of dough onto a parchment piece. Gently fit dough and parchment into 5-inch pie pans. (Edges of dough will look ruffled.) 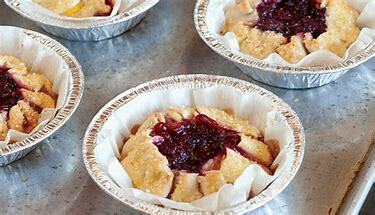 Fill each pie with ¼ cup blackberry filling. Fold dough edges in toward the center of each pie. 7. In a small bowl, whisk together egg and remaining 2 tablespoons water. Lightly brush dough with egg wash. Sprinkle turbinado sugar equally over each. Place 6 pies on each baking sheet, and bake until lightly browned about 20 minutes. Let pies rest on baking sheet 5 minutes. Transfer to wire racks, and let cool completely. Repeat process with remaining pies. 1. In a large bowl, beat butter, lard, and sugar at medium speed with an electric mixer until creamy. Add egg, and beat until fluffy. 2. In a medium bowl, sift together flour, baking powder, and salt. In a small bowl, combine milk and vanilla. Add ⅓ flour mixture alternately with ⅓ milk mixture, beating just until smooth, scraping bowl occasionally. Be careful not to overmix. Dough will be soft and sticky.